Welcome to the website of Royal Electric! 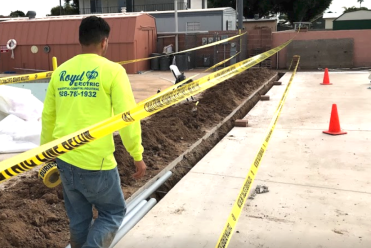 For over 50 years, Royal Electric has served Yuma with quality industrial, commercial and residential electrical services. We will make sure all your electrical needs are covered with our fully licensed, bonded and insured services. We have the experience and technical detail to work on all interior and exterior wiring and installation for all your residential and commercial electrical needs. We offer specialized services including troubleshooting, panel replacements, upgrades, new circuits, lighting, equipment hook up, home remodeling, construction, retrofits, meter upgrades, solar lighting, ceiling fan installation, outlets, spas, hot tub wiring and much more. With this many services it's no wonder we are Yuma's premier electrical contractor. Whether you need a new fuse box or repairs, we're here to help. All you need to do is give us a call and we'll take care of the rest. In the meantime, feel free to take a look around our site to learn more about what we can offer you. If you have any questions or concerns, please don't hesitate to contact us at any time.